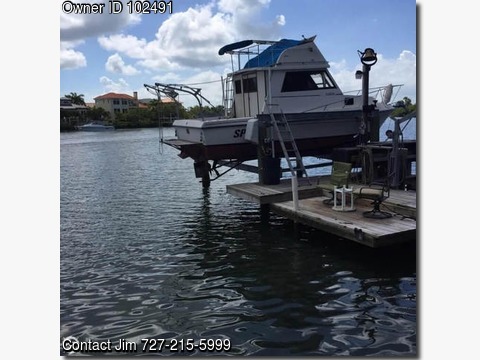 Boat is located in St Pete Beach,Fl.Please contact the owner @ 727-215-5999... 1987 DELTA 28 SPORTFISHERMAN FOR SALE!!! 2 months free storage included! This is a well-made boat with a great design. She is set up for the serious angler. Beautiful lines and functional setup! Powered by the legendary Caterpillar 3208 Naturally Aspirated 210 HP engine with approximately 1200 hours - those who know this engine know her history! With 150 gallons fuel capacity and 7-8 GPH at cruise, you have some serious range to get to the best fishing spots! The boat has a custom designed fresh water flushing system. She is stored on a lift high and dry. Lots of maintenance records available here. Continuous battery charging system included. Swim platform with stainless telescoping swim ladder. Terry seat covers. 2 docking poles included. Microwave. - bottom paint done in Feb - ceramic coated manifolds - fresh water tanks added to boat for wash down - oil pan replaced 2007 - considering offering 10" dingy at a very low price with the right offer or sold separately - 2 75 Gal. fuel tanks. The AC unit is 10,000 BTU and currently not functional for unknown reasons - boat has two portable units that come with her.